New for 2019, Tweethearts is a heartwarming interactive adventure for children and families with live music, beautiful bird puppets and an enchanting tea shop setting, and we will be touring the show at rural festivals this summer! Seeing Stars to return at Lancashire Science Festival 2019! Our popular science show Seeing Stars, about the life and work of the eccentric Renaissance astronomer Tycho Brahe, returns this summer to Lancashire Science Festival, from 27-29 June. The Northern Siren is coming to The Green Note! 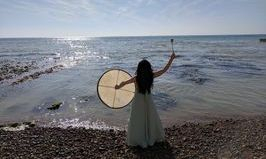 Eleanor's collaborative performance poem, The Northern Siren, created with double bassist Rosie Moon, returns in May. Join us for a wild, watery romance for double bass, voice and percussion!